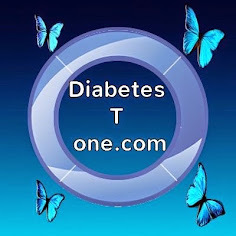 John & I are both type 1 diabetics "experienced but not professional" we are one year now gathering as much information as we can about both type 1 & type 2 diabetes and we'v learned an awful lot along the way. The thing about researching something is, it makes you very aware of keeping your eye on the ball. Meaning nearly 25,000 people have seen our posts in just 1 month, and are maybe just a tiny bit wiser, more aware and a little better educated. we'v run successful competitions, with happy winners. we'v spent countless hours on the phone supporting people with Type 1 Diabetes. 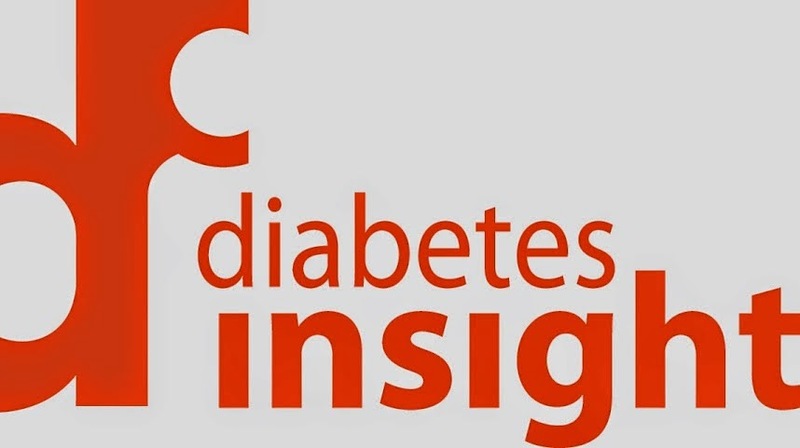 we'v worked with Diabetes Insight, and refer'd people to Helena where professional help was needed. We assisted in a Diabetes Insight information evening in the Westgrove Hotel, Clane, Co Kildare. We'v written weight loss with T1 blogs, which proved very popular. We'v been building our, low carb, Paleo, and low GI recipes page, but john is expanding this as we speak. We'v helped people source the information they requested, and much more. We'v secured sponsors, to help fund our website and admin costs, as we do this voluntarily. We had a Type 1 Diabetes Awareness video filmed, which can be viewed on the home page of our website. We have facilitated, new Glucose LX plus blood glucose meters to be sent to many people, with a delivery only a few days after they were ordered. "We are now registered with Kildare Public Participation Network"
(Kildare PPN) is a new framework for public engagement and participation. There will be more extensive and diverse input into decision making at local government level in Kildare. 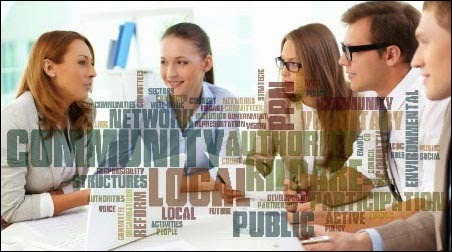 Through the PPN, people will be selected to participate in various processes of the County and its boards & committees. The PPN will be organised at County and Municipal District levels. The Municipal District PPNwill be made up of community/voluntary, social inclusion and environmental organisations within that particular district. At lunch time every day John has posted one of his recipes both to our website and our face book pages, but his dream was to create a website for foods alone. A website he hoped would work alongside www.diabetest1ireland.com And would be devoted to low carbohydrate and Paleo food Recipes. ~ to assist where ever we can in order to help make Thrive-abetes a huge success. ~ to increase our sponsor list to 3 or 4 sponsors. ~ to publish a monthly news update starting with this one, so please subscribe / follow, free to make sure your up to date with the latest information. ~ to continue the work we already do supporting and assisting people with diabetes. ~ to build a data base of contact details for support to people dealing with a new diagnosis of either type 1 or type 2 diabetes of all ages, so they can see the way forward when it comes to living with and managing diabetes. We can order a GlucoMen lx plus for you on your behalf FREE to be sent to you by post. 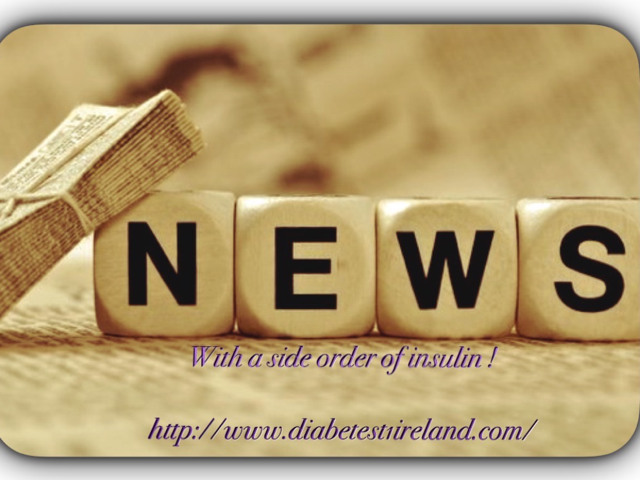 Just email td1ireland@gmail.com with your details or PM us on our facebook page Diabetes T1 Ireland. 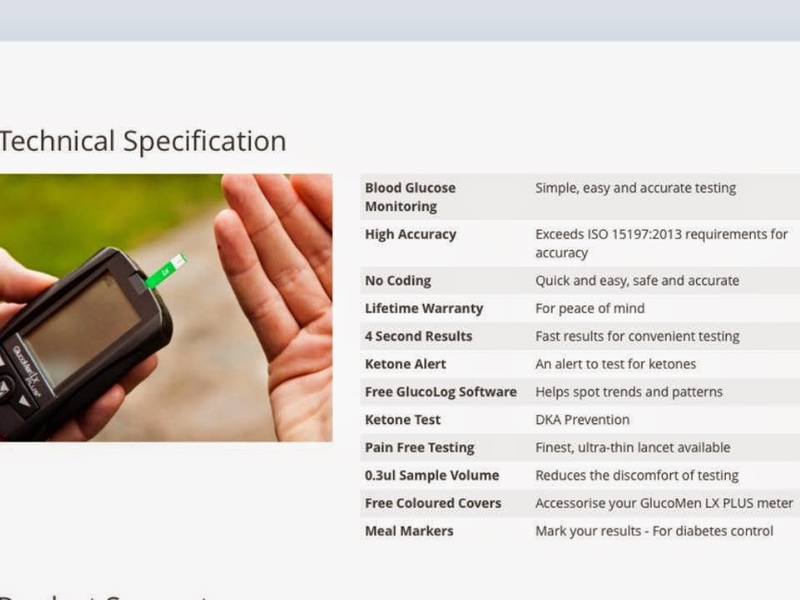 The GlucoMen LX Plus blood glucose meter exceeds ISO standards and is about the most accurate meter you can have. It is becoming increasingly popular in our Irish Hospitals and among both Type 1 and Type 2 Diabetics. All your data from the meter can be downloaded either directly to your computer or via bluetooth to the "GlucoLogLite" app on your smart phone. Your data can then be emailed either to your diabetes team or to your own email address for printing giving you a clear picture of trends at particular times of the day, therefore enabling better diabetes management. A button to flick out your used strip from the meter. Ketone strips come in a tub, so they are easier to use. Carry pouch can be worn on your belt, with the belt loop. New finger pricker that is very gentle on your fingers. Big easy read screen, and easy grip. Coloured gel cover FREE, once you'v registered your meter. You can order record books, & calibration fluid FREE also. The above 3 groups are closed support groups, once you find them just press join and an admin will accept you. Posts in these groups cannot be seen / viewed by the public. Only members can see them. The link here is for the petition being signed to go to the HSE. So please sign it. Thrive-abetes is a conference for people with Type 1 Diabetes and parents / carers of children / people with Type 1 Diabetes. This will be hosted and organised mainly by Grainn Flynn, Christine Meehan and Rebecca Flanagan, with some help form others on the sideline. type 1 diabetes? Do you want to hear their stories and draw support from them? also to learn more about ways to cope with #type1 #diabetes every day. There is room for only 3 more exhibitors at this conference so don't delay getting in touch with us if this is something you are interested in. The speakers confirmed for Thrive-abetes; Thrive with Type 1 Diabetes Conference. Helena Farrell from Diabetes Insight will discuss Diabetes Burnout with our group of adults with type 1 Diabetes. Find out more about Helena at www.diabetesinsight.ie your will also find out a little more in the post below. Joe Solo a Certified Diabetes Nurse, known in Ireland as diabetes nurse specialists. a Clinical Social Worker, a Family Therapist, a Motivational Speaker, Author, and Jedi Warrior. He is also president and founder of the company that produced the 2014 eBook "A Mile in My Shoes". Kate Fazakerly is Chair of the Families with Diabetes National Network since September 2014. Kate’s daughter, Isobel, was diagnosed with type 1 in 1999 when she was two. With 22 years of experience of raising a child with diabetes from toddler to teen with all the intervening ages and stages, Kate, Isobel and their family have navigated the highs and lows of starting school, playdates, school trips, exams and parties and have learned together how to tackle the challenges of growing up with the added challenges of type 1 diabetes. all information and up-dates for this event are posted in the events section, and this is kept up-to-date with details of speakers and whats happening as its happening. Follow this link https://www.facebook.com/events/751343231628358/ to join the event. The Conventional Approach to Diabetes Education Sees the Professional As the Expert in Your Diabetes. Diabetes Insights Approach Sees You as an Expert in Your Life, and as far as we are concerned that is exactly as it should be. 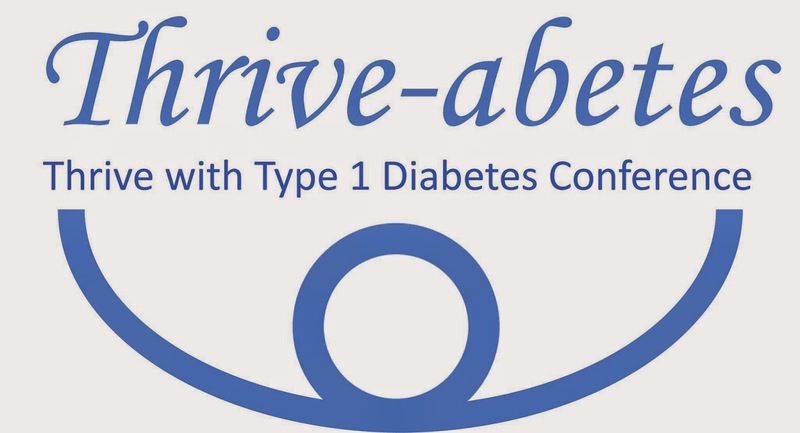 Helena Farrell from Diabetes Insight will discuss Diabetes Burnout with the group of adults with type 1 Diabetes at the Thrive-abetes Conference on 3rd October (venue to be confirmed and announced). The aim of the campaign will be to reduce the incidence of DKA at initial diagnosis of Type 1 diabetes. The primary focus will be on alerting GP’s and other community professionals on the need for blood or urine glucose testing earlier to out rule diabetes rather than the current wait and see approach. Now if your taking part in any events, or you think you'd like to organise one, we are asking that you consider this campaign as being worthy of your donations. Diabetes Ireland have a text donation number (Text diabetes to 50300) we can use this as we see fit… They can track how much comes through on any particular day… any upturn can be attributed to our push and this amount can be directed to the T1 GP Campaign. The ladies Mini Marathon is just one of the many events that will taking place so please consider carefully raising money for this particular project you can use the link to the web page http://www.diabetes.ie/fundraising/donate/ if donating, then select the ✔(2015/16 Type 1 GP Awareness Initiative option) this option Is also available if you wish to make a donation when renewing membership. ✔ Don't forget to nominate some friends to do the same. Send us your picture and donation screen shot. We will post it, or feel free to post to our page and we will share it, or here in the events section. After years of working in secret, the team at Locemia announced that they have made a dramatic advance in glucagon delivery technology. The mixing and injecting process has been replaced by a simple nasal spray. The product has already completed Phase 3 clinical trials and will be submitted for FDA approval by the end of this year. 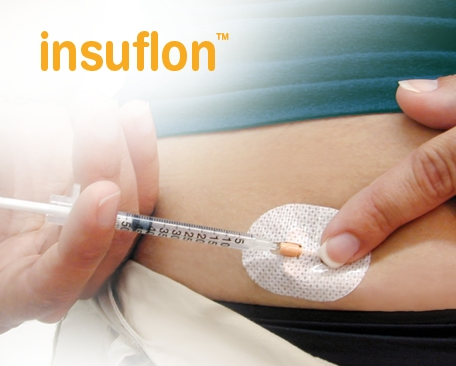 something we hadn't heard about before this month, is the existence of Insuflon. A tiny appliance you attach to your body to inject your insulin into, changed only every 5 days. so we were both surprised and excited when we heard about this. 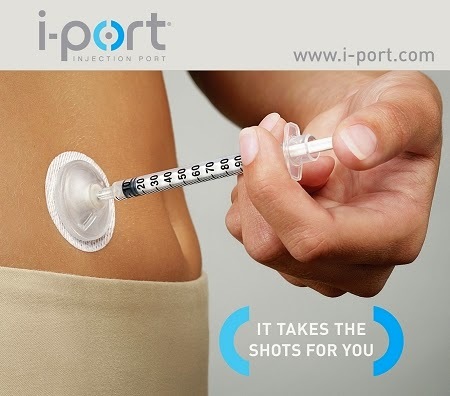 Iv used the iport and loved it, but never new another form of this existed. We contacted the folks at Insuflon with a few questions. Q1. Is it suitable for children and adults injecting.? Q2. Are there any reviews I could read ? Q3. Can people in Ireland order this from you online ? Q4. Is a prescription needed.? A1) The device was initially designed to simplify the injection process for children – to avoid repeated needle injections. It is also widely used by adults. A2) There are some reference document listed in the Insuflon booklet that I have sent. A3) We don’t have an online ordering system, but we can accept orders by phone and payment by credit card. However be aware that shipping to Ireland can be quite expensive. We will always use the cheapest form and charge accordingly. A4) No prescription is needed but we do like to have some notification from the care team that use of the device is approved. Unfortunately when they ship to Ireland they also have to add the VAT unless the recipient can give them an Irish VAT number for reference. They do currently ship to a few pharmacies and hospitals in Ireland so it might be worth investigation with a local pharmacy if they would be prepared to help out with small groups requiring these. We would like to include any information, news or events, T1 related pictures, any story, either generally or personally you'd like to share with us. Any ideas you might have. Basically we'd like you guys to fill this space. The good NEWS update on this is that I now have my very own CGM. Contacting medtronic Ireland and enquiring about a trial is a good idea. This gives you a feel for how it would effect your day to day management. Now bring totally honest, just like the pump it's an absolutely fabulous device, but not everybody might like it. I wouldn't want a pump, but that's just my personal choice. As Iv always said, there is NO, one size fits all, no matter what the device is. The other point Id like to make is that no matter what devices your using, ultimately it's you that must do the work, diligence, knowledge, control, and good management are all skills you will need. 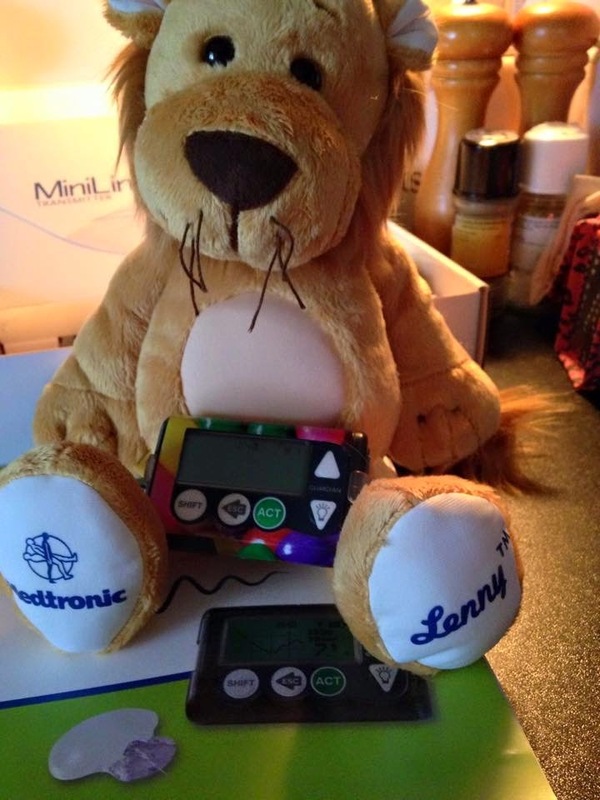 Once I was sure that the Medtronic Guardian CGM was 100% what I needed, I spoke to my diabetes consultant on 6th January and we discussed how my Trial went, and my reasons for wanting this. Dr a Kevin Moore ( my diabetes consultant ) wrote a letter of recommendation to our community care Hse office. A few weeks later I had a phone call from the Hse saying my application had been approved. That was Friday 13th February. By the end of February I had my CGM. The enlite sensors are 100% covered on my LTI . The whole process took 6-8 weeks. Yes you can purchase a CGM privately, but your sensors may not be covered on your LTI if you take this route. The sensors are about €50 each and one lasts for 6 days. You'd use 5 per month, that's €250.00 for sensors per month. We would welcome 3 or 4 sponsors during 2015. This will cover website, phone, admin, post & packaging, printing, and some other general expenses and to cover meetings etc. We are also hoping to support Thrive-abetes ( as seen above ) and the GP awareness initiative being promoted by Diabetes Ireland. Our sponsors will not be in competition with each other for business, we will of course include sponsors in our sponsors list or they can remain anon if prefered. If you would like to be one of our sponsors please email td1ireland@gmail.com and john or myself will be happy to help you. Diabetes is a chronic disease affecting millions of people throughout the world. Abnormally high blood sugar levels due to the underproduction of insulin and improper functioning of the pancreas results in this disease. I find a very good website for the Cancer medications , If you want you can visit this site.